Building a fire is fun—but can be tricky! Read on to learn how to safely and efficiently build a fire at your campsite. If a fire ring or designated fire site already exists at your camp, only use that spot to build a fire. If not, and if your campsite allows, prepare a spot in your campsite on dry ground with protection from wind and rain. If the ground is too wet you can build a dry spot out of leaves or use a base of dry bark. Avoid building fires near dry brush, dry grass, or rotten and dead stumps that can catch fire. TIP: Make sure before you start building your fire that it’s a good idea. Is it windy out, or do you have to go out of your way to find firewood? Then it might not be the best idea to build a fire. Also make sure that you’re allowed to build a fire—some campsites do not allow them. In order to build a successful fire, you need tinder and kindling to start your fire, and larger pieces of dry wood to keep it going. Make sure that any wood you gather is dead (not green on the inside) and dry (not bendy or wet), and make sure to gather much more tinder, kindling and firewood than you think you need. Tinder is the first to burn, creating the “spark” for the rest of your fire. Tinder should be “fluffy” material you find in nature or bring on your trip with you. Things like cotton balls with petroleum jelly or dryer lint make great tinder for campfires. 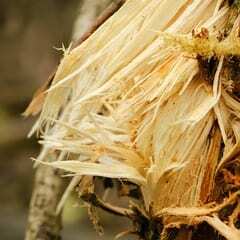 Natural tinder is dead and dry plant-based material (but not rotten), and can be found from grass, ferns, pine needles, inner tree bark, or fine wood shavings. 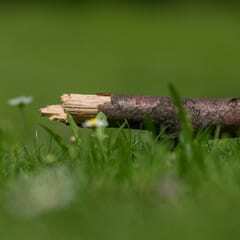 TIP: Scrape small twigs with a knife or sharp rock to create fuzzy, fluffy wood fibers to burn! 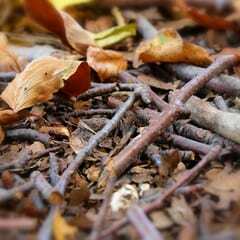 Gather kindling from dead twigs, vines, splinters and bark. 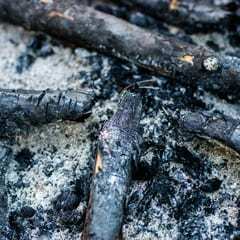 Kindling should always be as dry as possible, and be sure to collect different sizes from the size of your finger to the size of your forearm. Kindling is used to build teepees or log cabins around the tinder you gather to catch fire after the tinder. Collect dead wood of different sizes from close to your campsite, and organize them by size near where you plan on starting your fire. Don’t break living wood for your fire—that hurts the environment and the wood won’t burn. TIP: Practice good LNT skills by minimizing how far you go from camp to collect wood! 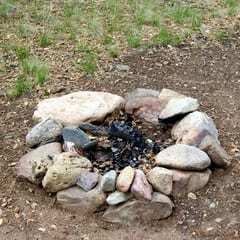 Pack your kindling pieces tight together as you build a teepee or log cabin in your fire ring. Bundle your tinder tightly into the shape of a bird’s nest and place it underneath the teepee or inside the log cabin. Make sure to kneel (don’t sit—kneeling makes sure you can get out of the way of flames or sparks more easily) by your fire when you light it. Face the direction the wind is blowing to block sparks from being put out by windy weather, and to not get smoke in your face. Use a match or other fire source to light the tinder underneath your teepee or log cabin. Gently blow upon the flames to help them grow and catch other parts of the fire. As the fire gets bigger, add firewood as needed. TIP: Be careful not to smother your fire! If you add big pieces too quickly, you’ll limit the amount of oxygen the fire is able to get to grow. Safety first: Put out your fire when you’re done with it so it doesn’t continue to grow. Even small embers if caught by wind can restart a fire, and potentially spread the fire beyond the fire ring when unattended. 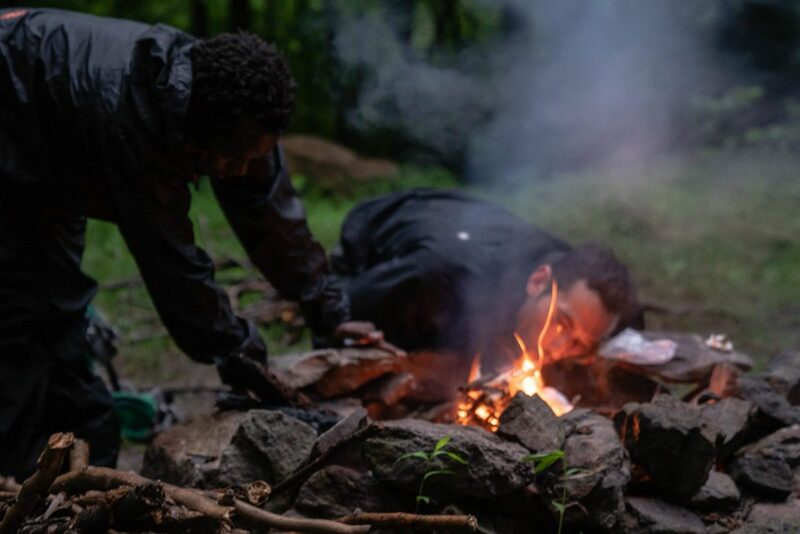 Make sure to pour water over your campfire to put it out, and stir the ashes with a stick to make sure it spreads to embers that may be buried. Your campfire should be cold before you go to bed for the night. Stay tuned for more camping tips for alumni from BCBOBS!